Description: Mt. 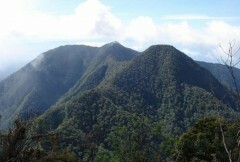 Malindang Range Natural Park is notable not only for being the highest natural landmark in the Zamboanga biogeographic region, but also for the economic, and cultural significance of its innate biodiversity. The Subanen indigenous peoples are the primary partners on the ground that FPE assists and enables in this priority conservation site. The range has 15 watersheds and is a major life-support system for 10 municipalities and three cities in the bordering provinces of Zamboanga del Sur and Zamboanga del Norte. Logging oprations and unsustainable famrming practicies have caused forest loss and the destruction if habitats of important wildlife - most of which are now highly endangered.